Keith Lodwick, curator of theatre and performance at the Victoria and Albert Museum, believes the new touring exhibition from the V&A, Vivien Leigh: Public Faces, Private Lives provides the opportunity for Leigh to “emerge from [her onetime husband Laurence] Olivier’s shadow” and be assessed on her own merit. Indeed, the Vivien Leigh who emerges from the exhibition wants to be master of her own career and wants to be seen as more than just a “hanger-on who has come along for the ride”. The exhibition features extensive material related to Leigh’s iconic screen performances in Gone with the Wind (1939) and A Streetcar Named Desire (1951). The film poster for That Hamilton Woman, in which the Oliviers starred opposite each other in 1941, is also on show, with Leigh’s name placed above her husband’s; a cause for discontent which may be the reason the couple never made another film together. 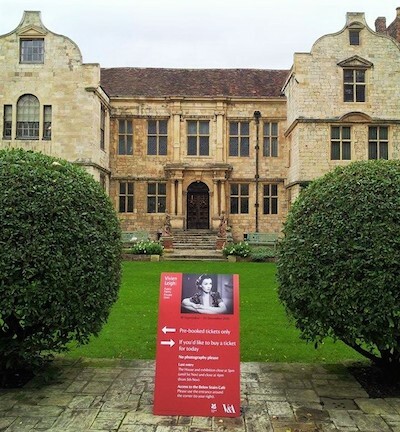 The exhibition is currently on show at Treasurer’s House in York, an historic house owned by The National Trust just a few streets away from the butcher’s shop Vivien’s great-great-great grandfather owned. 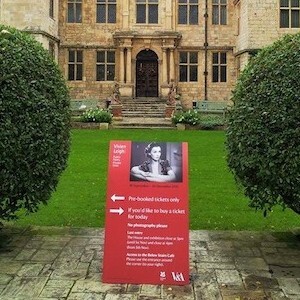 The exhibition, presenting a wide range of never-seen-before artefacts from Leigh’s illustrious life, is just a small sample of the material that makes up the Vivien Leigh Archive that contains over 10,000 items, including diaries, photographs, costumes, posters, stereoscopic slides and over 7,500 letters. The eclectic collection was acquired by the V&A in 2013 from Vivien’s daughter Suzanne on the centenary of her mother’s birth. Treasurer’s House is a fitting space for the exhibition, dispersing the material throughout the house. The theatrical nature of the show is enhanced by the fact that each space is set out like a separate scene in Leigh’s life story. The historic setting also emphasises the focus of the exhibition, utilising grand public areas such as the great hall to display Leigh’s public persona, whilst revealing her private life in more intimate spaces such as the West sitting room and dining room. Despite having ancestral ties to York and parents who were raised in the East Yorkshire seaside town of Bridlington, Leigh (born Vivian Mary Hartley) had a more exotic start to life. She was born in 1913 in Darjeeling, India, where her father Ernest was working as a stockbroker. At age 18 she took up a place at the Royal Academy of Dramatic Art and not long after she met her first husband, Herbert Leigh Holman, from whom she later took her stage name. They got married in 1932 and she gave birth to a daughter less than a year later. Motherhood was not a defining role for Vivien and she longed to fulfil her ambition of becoming an actress, almost pre-empting Betty Friedan’s conclusion to 1963 The Feminine Mystique when she said: “I loved my baby as every mother does, but with the clear-cut sincerity of youth I realized that I could not abandon all thought of a career on stage. Some force within myself would not be denied expression”. Leigh has received intense criticism over the years for her decision to pursue her career whilst her husband looked after their daughter. She admitted that she feared the power of the press but loved them when they didn’t ask her to talk about her baby. Women today still endure disapproval if they do not conform to the traditional role of motherhood or are made to feel inferior if they do not wish to have children. Leigh’s ambitious nature and lack of maternal instinct has received renewed scrutiny recently due to the death of her daughter Suzanne earlier this year. Clare Alton-Fletcher, Visitor Experience Manager at Treasurer’s House, points out, however, that the exhibition would not have been possible had it not been for Suzanne looking after her mother’s collection and then giving it to V&A, suggesting that the relationship between the two might not have been as hostile as reporters liked to think. From Vivien’s early years in the modest privacy of the West sitting room, the visitor then steps into the great hall, where theatre stage costumes worn by Leigh immediately catch the eye. Before Leigh, actresses such as Dame Ellen Terry and Lillie Langtry graced this space with their presence, entertained by the last owner of Treasurer’s House, Frank Green. Terry and Langtry both influenced Leigh, who had long studied the craft of acting and was dedicated to her profession (despite being termed the ‘Fame-in-a-Night Girl’ by theatre producer Sydney Carroll after her successful West End debut in The Mask of Virtue in 1935). It is in this grand space that we are greeted by Laurence Olivier, the man Vivien decided she was going to marry after seeing him on stage in Theatre Royal, despite both of them already being married. Just as her determination would pay off in her career, she achieved her aim in her second marriage. 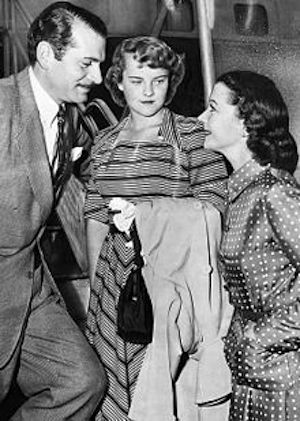 Although Leigh’s marriage to Olivier produced opportunities to further her career which might not otherwise have been available, the partnership to a certain extent eclipsed Leigh’s importance as an actress in her own right. In a Culture Shock film produced for the exhibition (displayed just before the exit), Lodwick comments that Leigh’s film performances “have really stood the test of time”, an achievement which might not be so easily bestowed on Olivier. Leigh’s most iconic role as Scarlett O’Hara in Gone with the Wind (1939), is celebrated in the opulent blue drawing room where the visitor enters Tara, the plantation owned by the O’Hara family in the film, while Max Steiner’s film score filters through the room. Images from the movie are projected onto a screen interspersed with nuggets of information about the production of the film and quotes from its stars. Vivien beat 1,400 actresses to play Margaret Mitchell’s heroine – her determination to get the role was vindicated not only by the universal acclaim she received for her performance, but also by her dedication to the part on set and beyond. A scrapbook featuring newspaper reports on this relatively unknown British actress who surprised everyone by winning the coveted role, is also on show in the room. Leigh went on to win the Academy Award for Best Actress for playing Scarlett, the first British woman to do so. Leigh’s tireless commitment to her profession earned her another Best Actress Oscar in 1951 for her part as Blanche DuBois in Elia Kazan’s adaptation of Tennessee William’s A Streetcar Named Desire. The room dedicated to this film is situated in the more modern part of Treasurer’s House that was used as a private flat until relatively recently. As the visitor crosses out of the South dressing room into the modern flat, the exhibition makes a similar transition. A Streetcar Named Desire introduced audiences of the time to then shocking themes such as mental illness and sexual violence, as well as the emerging concept of method acting as displayed by Marlon Brando and the groundbreaking use of a jazz soundtrack. Alex North’s score encases the exhibition room, providing a sense of confinement that evokes feelings of unease, which I imagine may reflect how audiences of the time received the production. A letter from Tennessee Williams to Leigh reveals that she was the Blanche he “had always dreamed of”, but Leigh’s resolve to put her all into her roles had devastating effects in this case. Olivier admitted that Leigh was severely affected by playing Blanche, as she over-identified with the character’s mental instability and promiscuous nature. Leigh suffered from bipolar disorder and her dramatic mood swings and infidelities during her marriage to Olivier eventually caused its breakdown. Angus McBean’s double exposure photograph of Leigh displayed in the exhibition was described by Olivier as showing the two faces of Leigh; the iconic beauty and the dark shadow that haunted her. In a time before psychiatric medications were introduced, Leigh underwent electroconvulsive therapy and had several breakdowns. The fact that she continued to be successful in her career whilst battling the mental illness she was afraid to reveal due to the stigma, is testament to her strength and perseverance. Although the exhibition clearly recognises Leigh’s struggle with bipolar disorder, it is refreshing to see that it keeps the main focus on her hard-won and well-deserved achievements. One of the highlights for me is the selection of stereoscopic slides that capture intimate moments between Leigh and her friends and family. The 3D images, projected to the visitor (now sporting a pair of 3D glasses) in a small dark room akin to a cinema, provide a perfect insight into the film star’s private life – her personality literally jumps out at you. Leigh loved socialising and entertaining friends, which is apparent from the extensive list of guests who signed the visitor book at the house she shared with Olivier, Notley Abbey. The book is on show in the dining room at Treasurer’s and aptly features a table plan for Christmas, as well as the names of some of the most famous actors and actresses of the time. The last section of the exhibition focuses on Leigh’s legacy. The corridor of the flat is adorned with film posters of Leigh’s outstanding performances, whilst her Crystal Star (L’Etoile de Cristal) award sparkles in the final display cabinet. Her performances on stage are also honoured; after her divorce from Olivier in 1960, Leigh went on to win a Tony award for her part in Tovarich, a Broadway musical, and no doubt she would have continued to delight audiences and critics alike had she not suffered an untimely death due to tuberculosis in 1967 at the age of 53. Leigh’s performances have inspired many actresses over the years. In a letter Leigh received from Judi Dench in 1967, Dench emphatically thanks her for writing to her to commend her role in The Promise. Dench tells Leigh that the letter she received from her is one of her “most treasured possessions”, which is fitting that it is now part of a treasured collection beautifully presented at Treasurer’s House. The exhibition is on show at Treasurer’s House, Thursday – Sunday, until 20 December 2015. It then moves onto another National Trust property, Nymans in West Sussex, where it will be displayed between 1 June and 4 September 2016. 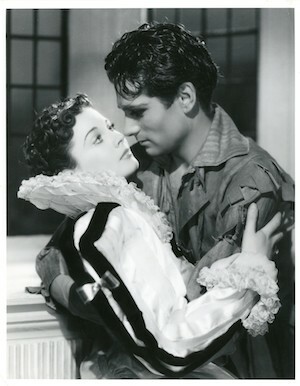 If you’re interested in the iconic screen couple, check out VivAndLarry.com, an online archive and film blog dedicated to preserving the memories of classic screen and stage stars Vivien Leigh and Laurence Olivier, edited by author Kendra Bean. First image is of Treasurer’s House in York, where the V&A exhibition Vivien Leigh: Public Faces, Private Lives is currently on show. There’s a red poster in front of the lawn, advertising the exhibition. Image is author’s own. Second image is of Vivien Leigh and Leigh Holman on vacation with their daughter Suzanne in 1950, shared under Creative Commons Licence. Third image: Vivien Leigh and Laurence Oliver in Fire Over England (1936) © Victoria and Albert Museum, London. 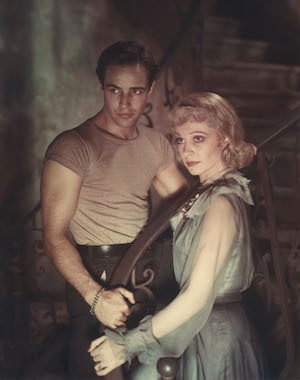 Fourth image: Vivien Leigh and Marlon Brando in A Streetcar Named Desire (1951) © Kobal Collection/Warner Bros.
Beccy Roberts is a doctor of architectural history working in the heritage industry. She has recently started her own blog Working with Anxiety about mental health issues, begun proofreading and copy editing for Wordscene, and contributing to Neeach, a social network dedicated to food. All this has given her a taste for writing that she hopes to keep feeding. Before Vivien Leigh struck major fame in GTWTW and her romantic liaison as one half of a super couple with Laurence Olivier, she played a number of roles as feisty, independent heroines. But after GTWTW and marriage to LO, she slipped into playing mostly tragic fallen women/ Perhaps these roles suited her view of herself as a woman afflicted with emotional vulnerability and mental illnesss. Whatever … It seems to me like a waste of an extraordinary talent. LO, meanwhile, went on to become the sacred icon of the theatre and film world, despite, IMO, having less than half her talent. Thanks for your thoughts, I agree that Leigh’s talent was not appreciated as it should have been and that she deserved as much (if not more) acclaim as Olivier. I’m not sure she viewed herself as emotionally vulnerable, however. In her marriage to Olivier she appears to have held her own and, according to those who knew them, she was still a strong feisty woman – even slapping and railing at Olivier backstage. Their marriage appears very complex and, unfortunately, I’ve not carried out enough research on it to argue that it affected her career to the extent that the roles she chose reflected her status as a wife. I’m hoping to look into her life in more detail as she deserves more recognition for her acting. I had no idea that she was in a physically abusive, unfaithful marriage. That’s quite a sad revelation for me as I’d always been a fan. I have to reevaluate my feelings towards her if this is true.